You won't earn a fortune but you may just be able to make some regular money by completing lots of surveys. There are many survey sites out there some of my favourites are Prolific and Swagbucks. Some surveys only take 5 minutes to complete where as others can take up to half an hour so do make sure you are able to grab something to eat whilst doing them. The ones which take longer to complete usually give a better pay out so keep that in mind, but if you complete them every day you will soon build up come extra cash over the year. Some will pay in cash and others will pay in Amazon vouchers which is why I like using Swagbucks. I've earned £50 from doing their surveys for half an hour a day the past month. Here's some more information about making money from surveys. Being paid to shop is a dream job for many, and there is a lot of money to be made with mystery shopping especially if you do it reguarly. You can get paid to eat, earn money for trying on new clothes or buying new toys and you are required to review and rate their service quality or quality of their goods. Payment for this type of work varies amongst agencies, some will pay with gift vouchers or cash and others will allow you to keep the free gifts. You can arrange to do some of these during your lunch break if for example you are required to go to the supermarket and buy something. Some of the most popular sites for this are MarketForce, Grassroots and Gapbuster. £1.50 free when you get a Graze box delivered for free. So if you do all of the above tasks that's already £11.95 free and you can do also get free cashback from Topcashback too! Another way to earn some cashback is to renew your car insurance or even switch your utility bills this can be done quickly on your lunch break whilst you eat your lunch at your desk. Some companies offer up to £100 for simply switching to theirs! This is more of a hobby but you can win lots of fantastic prizes, some which may help financially such as holidays, gift cards or even a year's rent paid for! It is a potentially profitable hobby for the lucky compers. Compers will source and enters hundreds of competitions and contests daily, after all you've got to be in it to win it! There are many competition sites to get you started and as well as doing it in your free time you could be entering as many as 30 competitions on your lunch break each day! Similar to survey websites Paid To Click (PTC) sites allow you to earn cash for completing short tasks such as watching videos, downloading apps and completing surveys. Some of my favourite PTC websites include InstaGC and Swagbucks where you can easily make around £20 worth of Amazon vouchers during your lunch break over the month. Join sites such as Fiver and People Per Hour where you can list your skills and recieve job offers which you can then complete during your lunch break. How much you earn will completely depend on what the job is and how the duration it takes to complete. I have used People Per Hour in the past and would recieve job offers for writing articles for other websites. If you have time to write an article during your lunch break then People Per Hour would benefit you. Fiver is great for doing little jobs such as creating a logo, moving someone's blog from Blogger to WordPress or designing a Facebook timeline cover. Whilst this may not make you money straight away, it will save you some time from doing it at the weekend or in the evening. List any items you are wanting to sell on eBay, Gumtree or local Facebook for sale groups on your lunch break and you may cash in some sales over the day whilst you're still at work! Now this won't see you magically earning money overnight, but over time it is a great passive income which can see you earning money reguarly from sidebar ads and numerous other ways whilst you sleep, work and are out shopping. Check out this post for ways to make money from a blog. This could be a great little earner on your lunch break, if you know any people close by to your workplace who would be interested in taking you up on walking their dog then ask! You could even create little flyers and put them through the letterbox of houses in the area as this will draw up some interest. You could earn up to £5 per dog and you can eat your lunch on the go! Win win! Just think if you two dogs during your lunch break 5 days a week that could be £50! There are thousands of smart phone apps, there's pretty much an app for everything these day including ones which you can make some extra money from. There are a number of apps which you can download and earn cash or gift cards from testing them and completing surveys or short tasks on the go or at home. So whilst you're eating your lunch, instead of browsing social media how about making some extra cash. Some of my favourites are Field Agent, Receipt Hog, StreetSpotr and Qustodian. 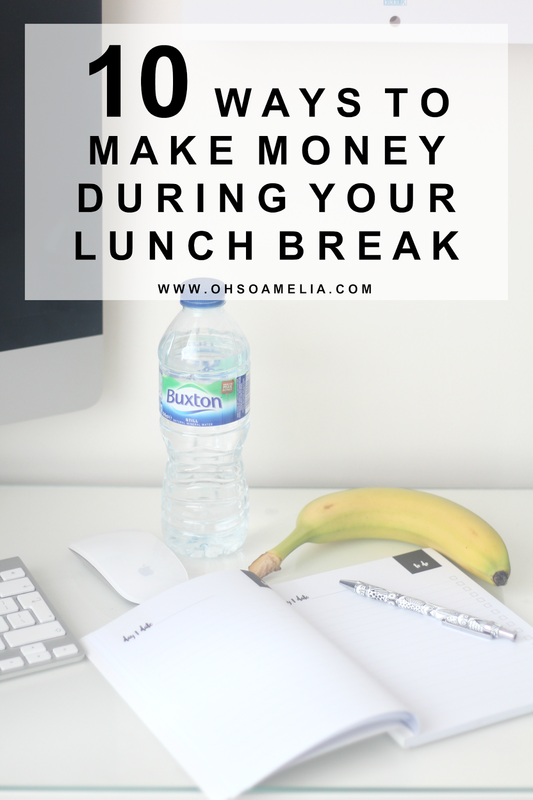 Have you thought about making money during your lunch break before? So many great ideas! Many that I had never even thought of. I'd start an Amazon affiliate review website which is sort of like your suggestion of starting a blog since the website would need a blog to support it. I'm always selling stuff on local selling pages, great little earner. Just hate when you have to meet the people lol. Some great little money earners here that I would never have thought of!! What a fantastic post, I really want to earn money while eating my lunch. All these 10 ideas looking good to follow them. Thanks for the valuable post. I've actually signed up to the survey sites after reading this - thanks so much for the tips! I have a Quidco account but always forget to use it! I really need to come back to this as this Blogging lark is seriously putting a dent in my bank account. Fantastic tips. I really need to start taking a lunch break hahahahaha I am trying to work from home fulltime now and it's tight but working but I think I need to do some extra other bits on the side as I am trying to finish my second book too but that doesn't pay the bills (yet) hahaha Need all the advice I can get and all the pennies I can get too. Nice article. happy to visit your blog. Thanks for sharing. hmm, I am not sure either these ideas really works but i am certainly going to try this out. Thanks for sharing such a nice post to earn some money during my lunch break, it seems a bit funny isn't it? Great tips here! I was a competition junkie a couple of years ago and was entering around 200 a day!! I lost my mojo and faith when all I got were sales calls and only a few wins like facecream and camping bags! But there are some great ones out there and if you go for the low entry ones you stand a much better chance of winning something!